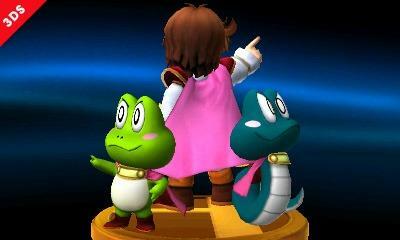 Another Japanese Nintendo Character Hops and Slithers into Smash Bros. I was already excited with the confirmation of Takamaru from The Mysterious Murasame Castle getting the assist trophy treatment in Super Smash Bros. for the Wii U and 3DS, but another lost Japan-exclusive Nintendo character has just been announced to join him. This is Sablé Prince from the Game Boy game Kaeru no Tame ni Kane wa Naru, translated as The Frog For Whom the Bell Tolls. His charming little adventure is a decent game on its own, but it is more famous as a test run of the graphic engine that would eventually power The Legend of Zelda: Link’s Awakening. In fact, several of the Prince’s animal friends and even his rival, Prince Richard, all make cameo appearances in Link’s first portable outing. 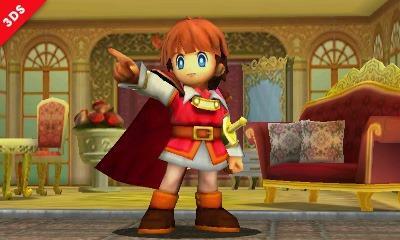 In this Smash Bros. installment, this little guy is also making an appearance! I…don’t know his name, but he’s the Prince of the Sablé Kingdom. He’s from the Game Boy game Kaeru no Tame ni Kane wa Naru (translated as The Frog For Whom the Bell Tolls), which was only released in Japan. He also confirms that the assist trophy will employ the Prince’s ability from his original game, transforming into frogs and snakes! Here’s the trophy of the Sablé Prince. He transforms into a snake or a frog, and unloads multiple attacks on any opponent he catches. Keep attacking your foes when they’re trapped in his dust cloud. It’s a nice addition and a wonderful nod to this lost game. Like The Mysterious Murasame Castle, it’s nothing particularly special in the gameplay department, and it has a lot of cracks that Nintendo obviously ironed out before making Link’s Awakening, but that shouldn’t stop you from finding a way to enjoy it. It’s a really charming and fun little game that could kill a sleepy afternoon. As of now, the best way to enjoy it is through the fan translation scene, but there is a ray of hope for a Nintendo 3DS version. Following Takamaru’s announcement, Nintendo also unexpectedly announced plans to release The Mysterious Murasame Castle on the Nintendo 3DS Virtual Console nearly 30 years after it first launched in Japan. Granted, Kaeru no Tame ni Kane wa Naru would require a much larger translation effort, but you never know. Could Nintendo also give the Sablé Prince a long overdue chance in America as well? One can dream, can’t he?